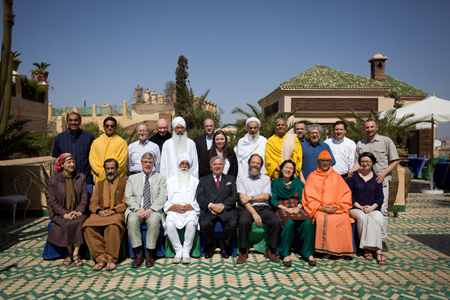 The second meeting of the Guerrand Hermes Forum for Interreligious Study of the Spiritual and Mystical Life took place in Marrakech from 15th to 17th March. 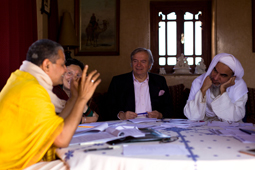 The meeting took place in the inspiring setting of the home of the Forum’s sponsor, Simon Xavier Hermes Guerrand, whose vision and generosity provide the foundaton for the Forum’s continuing work, during the annual meeting and between meetings. The meeting sought to implement and develop the foundations laid by the first meeting, a year earlier. 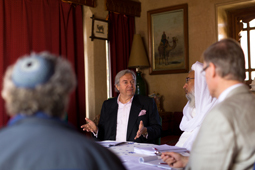 The inaugural meeting helped form a small community of committed scholar practitioners and leaders who recognize the importance of the study of mysticism and spirtuality for interreligious relations and who are willing to explore further the hypothesis that in this domain great commonalities and mutual understandings may be found, notwithstanding differences between religions. The nucleus of this community was a steering committee, that worked with project members between the first and second meeting. 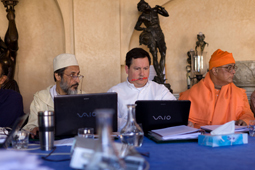 The number of scholars and leaders from the various traditons presently associated with the work of the Forum, is around thirty, most of whom have participated in one or both in-person meetings. During the first meeting a multi year working plan was put in place, and each year the Forum will explore two topics. These will be tackled through focused textual study, bringing to the reading of each individual text, the perspectives of multiple traditons. The topics that formed the focus of the second meeting were “Entering spiritual life”, and “Spiritual life and daily life”. The Forum seeks to not only enrich participants with spiritual exchangs, but also to share with the broader intereted public its discussion. Such sharing will take place through a dedicated website, shortly to be made public. 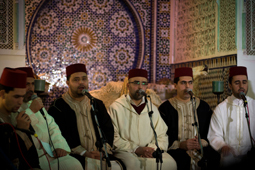 This website will feature texts, discussion, essays and videos that capture the conversations at the Marrakesh meeting. 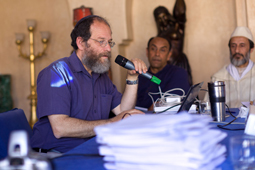 Participants at the Marrakech meeting spent part of the time inputting their comments on individual texts and themes into the website, and will continue to do so. We thus look forward to the website serving as an important resource for the study of mysticism and spirituality in world religions. Project participants were asked in advance of the meeting to choose and share textual selections, relevant to the meeting subject. They were also invited to comment on texts from other tradtions. This provided our meeting with a foundation upon which further work could be done. Given the textual and dialogical nature of the meeting, most of the meeting was spent in small group study of texts. Balancing the traditions studied and the membership within discussion circles made for intimate and profound exchanges on the core issus of the spiritual life. Three sessions were devoted to each of the themes, one broken down by traditions, the other explored thematically (the spiritual life as the totality of life/ daily rituals / ethical, social and political aspects of spiritual life). The following questions, that served as a theoretical framework for our discussions, could be useful for other groups and initiatives. 1. How does your tradition understand the fundamental human religious problem (s)? What is its origin, if any? 2. What factors/experiences motivate a human being in your tradition to embark on its spiritual and mystical path? 3. How is the spiritual and mystical way in your tradition a solution for the human problem (s)? 4. How is the character of your path determined by what your tradition teaches about the nature of God/Ultimate Reality? 5. Is it appropriate to speak of the spiritual and mystical life in your tradition as consisting of progressive stages, states? What are these? 6. Does the spiritual and mystical way in your tradition require a teacher/guide, guru? How do you understand the role and authority of such a person? What is the relationship between the authority of a teacher/guru and other sources of authority in your tradition? 7. Are there elements of your spiritual and mystical path that may be shared with persons not belonging to your tradition? Do these come across in the texts shared between us at this meeting? 8. Does your spiritual and mystical path allow you to learn from the teaching and practices of other paths? If so, how do you determine what may be incorporated from other traditions? Which of the texts from another tradition have the potential to inspire you to either deeper understanding or to enhance practice? 9. Does your spiritual and mystical path result in the transformation of human relationships and the quality of life in human communities? What Did We Learn? What Do We Share? 10. Has your learning about another spiritual and mystical way (as reflected through specific texts) challenged/enriched your religious self-understanding? 11. Are there commonalities in our spiritual and mystical paths that contribute to fostering harmonious relationships among our traditions? Do they confirm the hypothesis that mysticism and spirituality provide a meeting point beyond religious diversity? The question of similarities and differences is particularity relevant to the work of the Hermes Forum, and also informs many of the following observations. Concerning the first theme, “Entering the Spiritual Life”, it was recognized this is in fact a multidimensional reality, and it is accordingly captured and conceptualized in many different ways. Significantly, the differences in conceptualization/understanding between different religious traditions were found on the whole to be no greater than the differences within particular traditions. 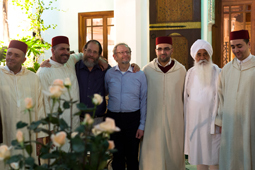 It was thus acknowledged that we could learn from one another and broaden our personal understanding almost regardless our religious belonging. In each tradition entering the spiritual life contains a creative tension between its negative side (penitence etc.) and a more positive one (quest for enlightment etc.). The spiritual life begins with some ‘no’ ( to forms of material life, to ego etc.). Then comes some ‘yes’ (trust, risk, embracing something). Even if we speak of entering the spiritual life as a particular moment, in reality we are relating to a series of events, enterings into different dimensions of spiritual life. To simply think of entering the spiritual life is thus an illusion. Who is the actor of entering spiritual life? The individual? The divine? What is the role of free choice and what room is there for other superhuman power (grace)? To what extent is the notion of (ritual) initiation and rebirth important for understanding entering spiritual life? What role does the guru/master/teacher play in entering the spiritual life? Some important differences between the traditions emerged. For some, initiation is crucial, while for others it is optional or even marginal. It was acknowledged that Judaism may be the least initiatory tradition. There seemed to be a difference between Judaism and other religions as regards the necessity for some spiritual “new birth”. As every Jew is born as a member of the covenant, s/he can develop this covenantal relationship with God, with no need for some other spiritual “birth”. Other traditions recognize some point in the human life as a point of spiritual birth, which can be treated as the first point of entry into the spiritual life. Similar outcomes emerged from conversations on the second topic, “Spiritual Life and Daily Life”. Here great similarities emerged between the traditions. In the teaching of all traditions one can discern a threefold expression of the spiritual in its relation to daily life. 3. Expressions of the spiritual life within daily routines. One important commonality emerged in the recognition that all religions stress that compassion increases along with spiritual development. With reference to present day social context of spiritual life, discussion took place concerning the challenges to spiritual life posed by technological advances. Do these indeed pose unprecedented challenge to the quality of our spiritual life, our abililty to concentrate and to prioritize our life? Were the classical texts of our traditions authored under very different social/civilisational settings and does it make them less helpful to present day challenges? For some participants the changes and challengs we face may be quantitatively more,but essentially the same as those of our predecessors. For others, we see qualitative changes, that make our human and social situation in some ways fundamentally different than that of earlier generations. In this edition’s Sharing Wisdom section, we would like to share some glimpses into the workings of the Forum. To see a sample of a textual offering, with commentary and discussion.